He meant that he understand the imoporatnce of Japan-US Security treaty however Okinawa will not tolerate Jap. government attitude like tampering a history in school text book about a forcement of mass suicide by Jap. soldiers at the battle of Okinawa else more deployment of Osprey in Okinawa. Mr. Onaga pointed out that LDP members used to be more understandable about Okinawan issue and situation. 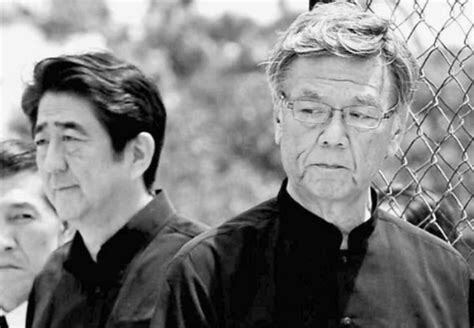 Old LDP members who knew the battle of Okinawa had a sentiment of sorry about those problems in Okinawa. On end of July. Governor Onaga expressed in front of cameras that Okinawa Gov. will revoke the permission of a land fill in Henoko U.S. new base. He had been on a medication of anti cancer drug. He could resign. And He may be survived. There is a no one of replacement of Mr. Onaga. He was the one who could unite Okinawan conservatives and Liberals. Yesterday, 31st Aug. Okinawan Gov. did a revoke of Henoko land fill permission. Japanese Gov. likely to take action to end the validity of permission and bring into court. By the death of Okinawn governor, an election will come up on 30th Sep.
LDP bring up Mr. Sakima. He was a Ginowan city mayor. He resigned and run for the election. successor to the Mr. Onaga will be Tamaki Denny. He is an member of diet. I hope that unity of Okinawa will not be divided again.